Etcetorize: Plaid Extreme Glitter Paint Winner! Yay!! 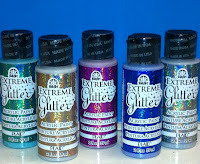 We have a winner for the Plaid Extreme Glitter Paint Giveaway! Comment # 14 from Mindy was the lucky comment!